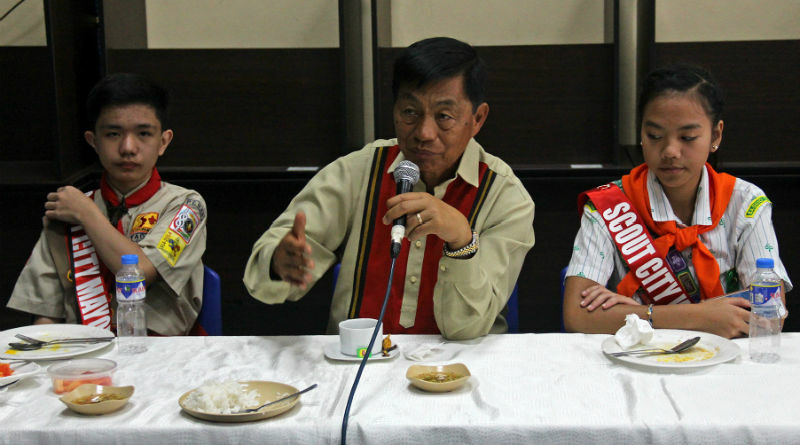 BAGUIO CITY – Mayor Mauricio G. Domogan challenged the boy and girl scouts to shy away from vices that could affect their studies and their being molded as responsible and dedicated citizens not only of the city but also the whole country because vices actually affect the minds of people. Speaking before the Scouts Officials for A Day (SOFAD) during the regular Monday flag raising ceremony, Domogan exhorted today’s youth must avoid embracing vices such as smoking, drinking and gambling, because these are considered as part of the evils of society that will surely affect their growth and development as future leaders because once addicted to such vices, it will be very difficult to them to shy away from the said vices. “You should always listen to the advice of your parents and your older brothers and sisters because they want you to become successful individuals, especially in your desired professions, without being affected by whatever vices,” Domogan stressed. He claimed that based on data from the City Social Welfare and Development Office, it is unfortunate that those who are being exposed to numerous vices are youth from broken families or those neglected by their parents who are searching for companions, thus, some of groups take advantage of these youths’ situation by encouraging them to join groups who may be involved in illegal activities and vices leading them to become children in conflict with the law. Thus, according to him, the need for the crafting of the appropriate interventions to allow those who are being exposed to vices to be spared from the serious negative effects of these vices. He explained the SOFAD serves as a training ground for future leaders of the city and those chosen to participate in the annual program of the local government are lucky to have the chance to experience administering the affairs of the city even for a single day. The mayor reiterated the local government continues to support the annual implementation of the SOFAD so that deserving youth leaders from the different schools in the city have the chance to be exposed to the rigors of government transactions and for them to be familiarized with how are local officials and employees attend to the needs of people transacting businesses with the said offices. Qualified boy and girl scouts from different private and public schools in the city are screened as Scouts Officials for A Day on who will takeover the various elected and appointed positions of the city for them to experience leading the local government.